President Muhammad Buhari has directed service chiefs and entire leadership of the nation’s Armed Forces to intensify and perfect current strategies and techniques toward curtailing criminalities across the country. 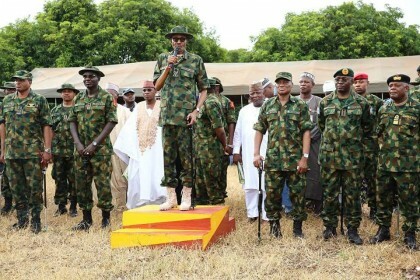 The president gave the directive at the grand finale of the 2016 Nigerian Army Day Celebration (NADCEL) in Gusau on Thursday. Represented by the Minister of Defence, retired Brig.-Gen. Mansur Dan-Ali, the president said that intensifying current efforts would put an end to all forms of criminalities being perpetrated across the country. Expressing satisfaction with the level of professionalism displayed by the armed forces, he assured Nigerians that the current efforts would yield positive results. He restated his administration’s commitment toward enhancing operational efficiency of the Nigerian Armed Forces to effectively discharge their constitutional roles. Buhari said that the Federal Government remained committed to ensuring that the military was provided with required resources and impetus to operate professionally and efficiently. “With what I have seen today, I am quite confident as all other Nigerians that the Nigerian Armed Forces has been repositioned ever than before to resolutely confront security challenges in our country. “I implore all officers and soldiers of the Nigerian Army to sustain the current tempo in the various operations across the country. On his part, the Chief of Army Staff, Lt.-Gen. Tukur Buratai, said that the hallmark of the celebration was the training amid “real time combat operation’’. He said that the exercise and operation which started some days earlier had yielded results as many enclaves of the criminals had been dismantled. “This year’s Nigerian Army Day Celebration (NADCEL) is quite unique because of the major training to drive the Army’s operational readiness and to address security challenges in parts of the country. “The exercise is also an avenue to expand ongoing operations in collaboration with sister services and security agencies to tackle cattle rustlers and armed bandits in the North-West. “I am glad to announce that the exercise has been a huge success and I want to call on the people of the affected areas to return and continue with their legitimate businesses,” he said. On the North-East operations, Buratai said that the stabilisation phase of the fight against insurgency was progressing accordingly. He said the army had in the last one year conducted its operations in the most professional manner. According to him, the army has in the past year aligned itself to improve its relations with the public even as it employed kinetic and non-kinetic strategies in addressing security challenges. The army chief paid glowing tribute to the officers and men, especially those that paid the supreme price in the fight against insurgency. He assured the political class and other Nigerians of army’s commitment to keeping Nigeria united and safe. According to him, the commitment and unalloyed loyalty of the Nigerian Army to the nation remain unchanged and officers and soldiers will continue to remain apolitical.